Denison, Iowa - This winter may have started out mild, but there is no disputing that sub-zero temperatures have arrived in our area and will be hanging around for many more months. Though we have plenty of shelter to ride out the polar vortex, cattle need a hand to weather these cold snaps. University Extensions, local experts and the team at FarmOn.com have offered the following tips to help your herd warm up to a healthy spring. 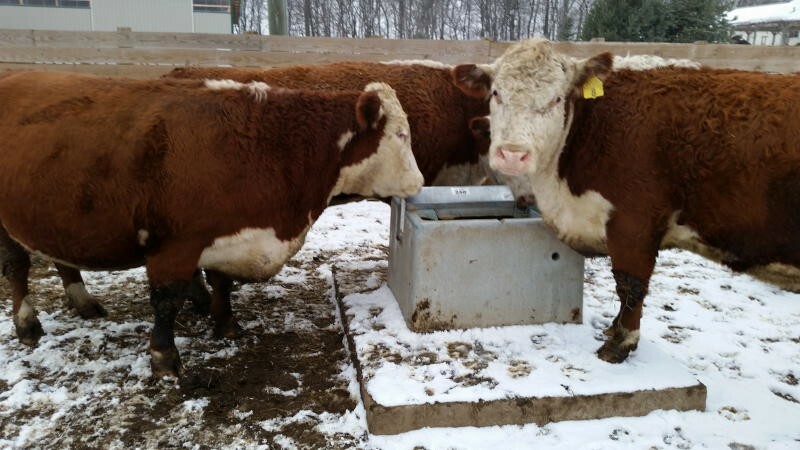 Water should be your first concern in cold weather--though cattle may not drink as much in colder temperatures, it is still vital. Keep natural water sources open and accessible during winter months, and make sure that waterers are well-maintained. "We frequently make recommendation to our clients to keep a spare heating element and thermostat on hand," said Aaron Johnson, Bohlmann Quality Products' director of sales and operations. "Regular cleaning and maintenance are also critical. Producers need to keep elements free of mineral build-up and feed debris. Ensuring water is available for the cattle could be as simple as cleaning off the foreign material with a wire brush." Make sure that cattle can get relief from high winds. They will take shelter in hills, trees, brush or fenced areas. A temporary shelter in the field, however, is ideal. Though many producers realize the need for increased feed to offset the energy required to maintain core body temperature, most are unaware that the need is directly correlated to the cow's body condition. FarmOn.com recommends adding one percent more feed for every degree below 20 degrees fahrenheit for cows in good condition with a healthy winter coat. For those that are thin and/or have a thinner coat, the additional feed needed is closer to two percent for every degree below 30 degrees fahrenheit. Another recommendation is to feed cattle at night. The energy needed to digest food produces heat, and this helps the cow through the colder, nighttime temperatures. Moisture in cold temperatures must be addressed. "Bedding may not alway be necessary for the wintering cow herds, but in cases where cattle are wet, bedding is a must," said Carl Dahlen, North Dakota State University Extension Service beef cattle specialist. "The purpose of bedding is to help keep cattle dry." The cold hard fact of the matter is that with the majority of producers entering the calving season during critical temperature shifts, steps to keep animals protected from cold, wind and moisture can become the pivotal element in profitability. If you have questions about how to protect your herd from the elements and manage their feed needs, contact your local university extension program. If you have questions on how to manage the water supply for your herd, contact the staff at Bohlmann Quality Products by phone at 800.325.2380 or log on to www.bohlmannlivestock.com.